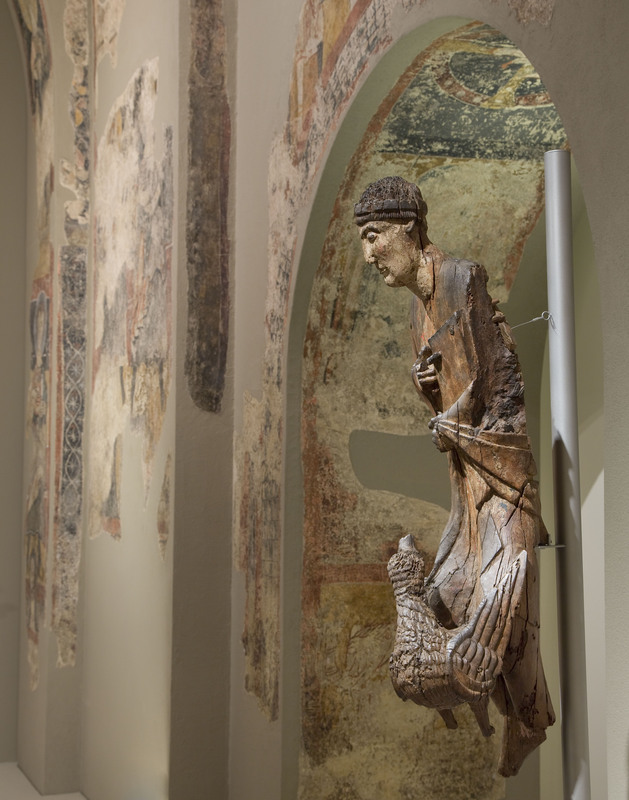 The Carving of Saint John the Evangelist from the VINSEUM Museu de les Cultures del Vi de Catalunya, in Vilafranca del Penedès, occupies a privileged position in the wooden Romanesque carving of Catalonia, even though its exact provenance still remains a mystery. It probably formed part of a larger group or else of a piece of liturgical furniture. In terms of style it belongs to the set of sculptures from the Western Catalan Pyrenees, included in what has come to be designated the Taller d’Erill (Erill Atelier), which dates back to the twelfth century. 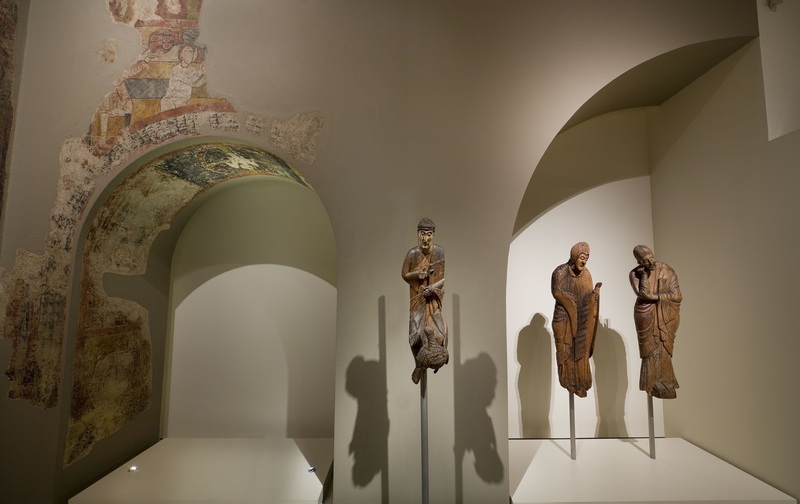 For this reason, Sant Joan is exhibited as if in dialogue with other images from Erill la Vall, Taüll and Durro, in the Vall de Boí, all of which are preserved at the Museu Nacional d’Art de Catalunya. 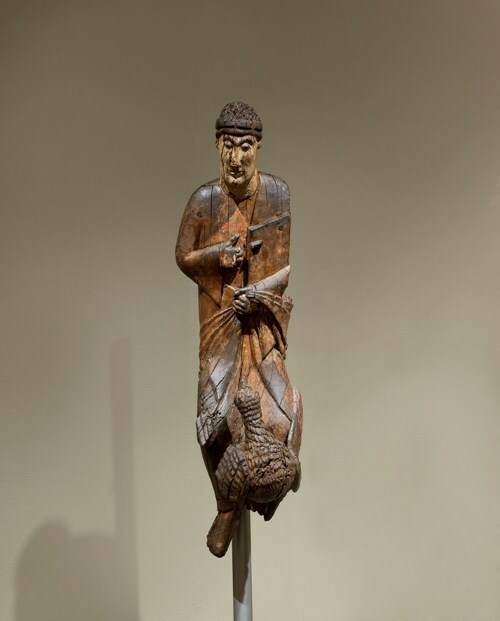 The wooden carving we present here depicts a beardless male figure, seen practically from the front, with an eagle at his feet, which identifies him as John the Evangelist. His right-hand index finger points towards the book he is holding in his left arm as a symbol of his mission to spread the word of the Gospel. In a subtle gesture, with his left hand he gathers the sleeve of his cloak. Part of the left side and most of the original polychromy have been lost. Note the elegance of the folds, the slight movement of the body and the potent volume of the eagle’s head, all of which denote the excellent quality of the carving. Thanks to meticulous analysis and a scrupulous restoration process, it has been possible to recover the piece and obtain information on its material and technical components, such as the pear-tree wood from which it was sculpted.